Written by Janet Choi on July 20, 2015 . A common question when someone unsubscribes from your emails is: “Which email did they unsubscribe from?”. Or “From which email did they unsubscribe?” if you want to be grammatically correct. 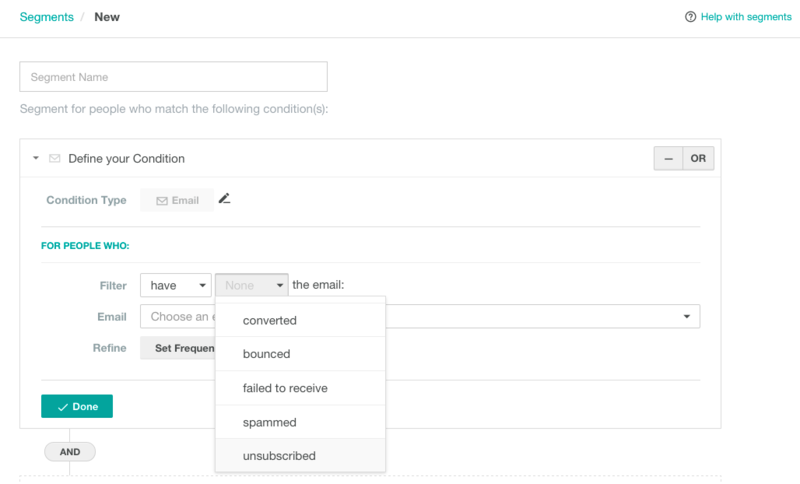 Now unsubscribes get attributed to specific emails and campaigns so you can get a better sense of how your messages are performing, as well as segment by unsubscribe behavior. View your unsubscribe rate and count per email, campaign, newsletter, person, and over time. You can also create segments based on unsubscribe activity to better target your messages going forward. To do so, create a new segment based on email behavior. Then filter for “have” or “have not” unsubscribed. Check out the new unsubscribe rate metrics and let us know what you think! Leave a comment or send us an email at win@customer.io.